For about $300 in equipment costs, anyone can produce working electrical circuits in the 60 seconds it takes to print them. Researchers from Georgia Tech, the University of Tokyo and Microsoft Research have developed a novel method to rapidly and cheaply make electrical circuits by printing them with commodity inkjet printers and off-the-shelf materials. For about $300 in equipment costs, anyone can produce working electrical circuits in the 60 seconds it takes to print them. The technique, called instant inkjet circuits, allows the printing of arbitrary-shaped conductors onto rigid or flexible materials and could advance the prototyping skills of non-technical enthusiasts and novice hackers. Recent advances in chemically bonding metal particles allowed the researchers to use silver nanoparticle ink to print the circuits and avoid thermal bonding, or sintering, a time-consuming and potentially damaging technique due to the heat. Printing the circuits on resin-coated paper, PET film and glossy photo paper worked best. Researchers also made a list of materials to avoid, such as canvas cloths and magnet sheets. To make the technique possible, researchers optimized commercially available tools and materials including printers, adhesive tape and the silver ink. Designing the circuit itself was accomplished with desktop drawing software, and even a photocopy of a drawing can produce a working circuit. Once printed, the circuits can be attached to electronic components using conductive double-sided tape or silver epoxy adhesive, allowing full-scale prototyping in mere hours. The homemade circuits might allow tinkerers to quickly prototype crude calculators, thermostat controls, battery chargers or any number of electronic devices. April 15, 2019 - Industrial Inkjet Printers Market Size is set to Grow at a Remarkable Pace in the Coming Years Microfinance Observer“Global Industrial Inkjet Printers market witnessed a substantial growth rate and is expected to have an escalating growth rate over the forecast period. April 11, 2019 - Arkema Starts a 30% Photocure Resin Production Capacity Increase at Its Sartomer Site in China Business WireRegulatory News: Arkema (Paris:AKE) has successfully started up the 30% capacity extension of its photocure advanced liquid resin production plant in. April 9, 2019 - Vertical Agreements in the USA LexologyUse the Lexology Getting The Deal Through tool to compare the answers in this article with those from other jurisdictions. Legal framework. Antitrust law. March 14, 2017 - Bonding chips using inkjet printers: Using ink with silver nanoparticles offers capability for new rigid and flexible hybrid circuitry Science DailyResearchers have demonstrated a new bonding technique for surface mounted devices that uses an inkjet printer with ink that incorporates silver nanoparticles. June 15, 2018 - Inkjet-Printed Graphene Plus Laser Yields Washable Electronics Electronic DesignPrinting an ultrathin layer of graphene on a substrate and using direct-pulsed laser writing produced a structure for circuitry that can be worn and washed. February 26, 2018 - Scalable Printing Sensors and Electronics at the Nanoscale R & D MagazineThe next generation of printed devices requires a technology leap to print features at today's silicon electronics line width. March 29, 2017 - Printed Copper Inks Now Available for Conductive Patterns Machine DesignPV Nano Cell's Fernando de la Vega talks with Machine Design about how copper-based inks stack up against their silver counterparts. November 7, 2018 - Printed Electronics World Firsts in 2018 IDTechEx.comWith the end of the year in sight IDTechEx looks back and reviews what has been new in the world of printed electronics in the last 12 months. November 23, 2017 - Washable, Wearable Electronic Circuits Printed onto Fabric DesignNewsResearchers at the University of Cambridge have used graphene-based ink and an inkjet-printing process to print integrated circuits onto fabric. September 2, 2016 - Laser pulses improve printed graphene circuits Futurity: Research NewsLasers boost inkjet-printed graphene circuits without hurting the material they're printed on. Are paper-based electronics on the way? November 9, 2017 - Graphene-based inks form basis for integrated circuits on fabric The EngineerResearchers from the Cambridge Graphene Centre have led a project to print fully-integrated circuits directly onto fabric for the first time. December 15, 2017 - Fully integrated circuits successfully printed directly onto fabric | News Cordis NewsIf wearable electronics are to become commonplace, a breakthrough is required which allows them to be washable, stretchable and breathable. 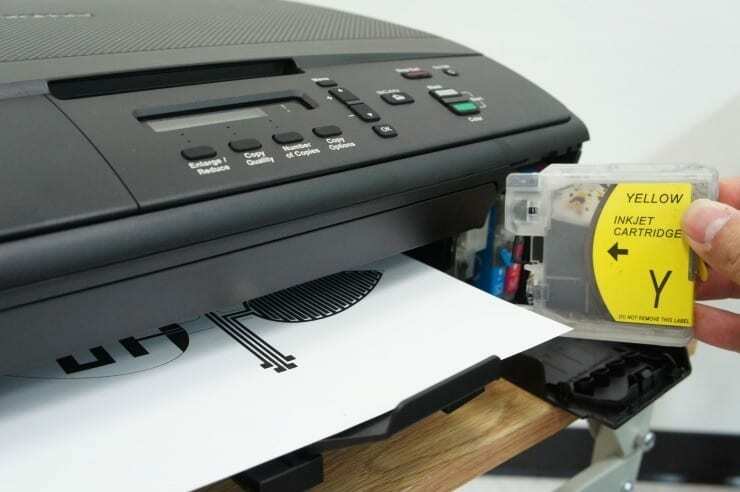 October 3, 2013 - Print a working paper computer on an $80 inkjet New ScientistImagine printing out a paper computer and tearing off a corner to share – ink laced with silver nanoparticles could make it a reality, to the joy of hobbyists. December 1, 2016 - Printed Circuits | Research Horizons Research HorizonsFor pilots, having instant access to data about their aircraft is crucial to safely navigating the skies. January 8, 2019 - Flexible Printed Circuit Board (FPCB) Market: Global Industry Analysis, Size, Sales and Forecast By 2025: RSI Says What They ThinkTuesday, January 08, 2019. Press release from the issuing company. Flexible Printed Circuit Board to Stay Rumenarative throughout the forecast period. July 16, 2018 - How to Recycle or Donate Your Old Printer PCMagWhether your trusty inkjet or laser has spit out its last page, or you're just looking to upgrade, here's how not to land your old printer in a landfill. April 5, 2017 - Inkjet-Printed Flexible Memory Devices IEEE SpectrumNew memory cells could find use in wearables and print-on-demand electronics. January 25, 2018 - Graphene ink could lead to washable electronics Futurity: Research NewsPrinting with graphene ink could mean new electronics with incredible properties, including flexibility and resistance to germs or water. February 6, 2018 - Edible electronics tattooed on your food could help track your health MIT Technology ReviewThe development of organic circuits that can be transferred onto food and pills paves the way for a new era of biomonitoring. April 1, 2019 - CEVA (NASDAQ:CEVA) & TOKYO ELECTRON/ADR (TOELY) Head-To-Head Contrast Fairfield CurrentCEVA (NASDAQ:CEVA) and TOKYO ELECTRON/ADR (OTCMKTS:TOELY) are both computer and technology companies, but which is the superior investment? November 24, 2011 - First Demonstration of Inkjet-Printed Graphene Electronics Technology ReviewThe 'wonder material' of modern science now promises all-printed, flexible and transparent graphene devices on more or less any surface. November 14, 2017 - New 3D-printing technique uses UV light to print working electronic circuits Digital TrendsResearchers from the U.K.'s University of Nottingham have invented a breakthrough approach to 3D printing functional electronic circuits. January 10, 2019 - Digital deposition equipment for fabrication of perovskite solar cells Printed Electronics WorldLatest results achieved with third generation solar cells highlight that the perovskite can increase the efficiency and lower the cost of solar energy. January 29, 2019 - All-in-one transparent transistors Phys.OrgSmall tweaks in component ratios generate electronically different layers from the same material to create transparent transistors.